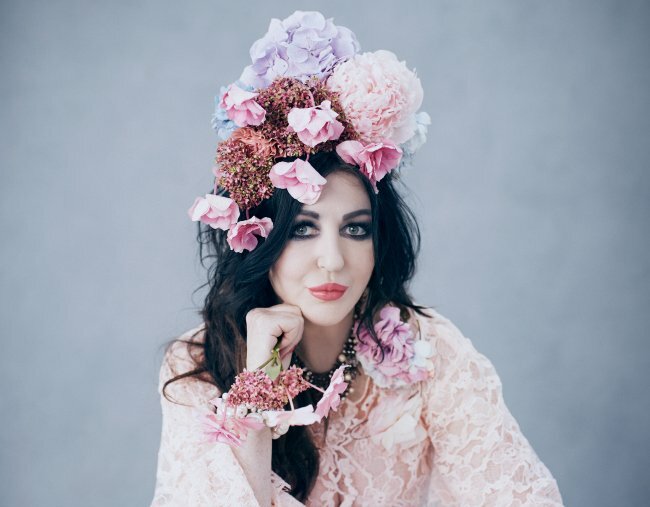 Alannah Hill's book, Butterfly on a Pin: From top designer to unemployed. From high-flying fashion designer to unemployment: why Alannah Hill walked away with nothing. I knew something was wrong when Dolly Parton’s ‘9 to 5’ stopped working for me. Everything that had been a strength of my brand was suddenly a weakness. I was too old to be the face of the Alannah Hill Brand, and I was ruining the crumbling empire by the fact that I was Alannah Hill. I needed a makeover. A Woman’s Day article on Kerri-Anne Kennerley’s fabulous new makeover was pushed toward my desk. I needed to be cooler. I needed to be ‘out there more’, out there in all the right places, and not just staying at home with E.
Heightened fear is a different kind of fear. It holds a great deal of power and clings to us with all its heightened glory, and just like Glad Wrap, eventually it suffocates and destroys its victim. With a red-carpet flourish and a perfectly manicured hand, I unfortunately welcomed ‘heightened fear’ in like a long-lost baby shower. Heightened fear does not work well with feelings of zen, or spirituality. In fact, it nukes all of our more delightful feelings and concentrates on the negative parts of our personalities and psychodramas. I had been running away from my issues at work, E’s drama classes and basketball lessons, school trips, the Alannah Hill VIP events, and attempting the impossible – attempting to be an intelligent, fun, focused and well-adjusted mother, and at the same time, a mysterious, unavailable, cool and ‘happening’ girlfriend. I worried I was a bad mother. The small number of other mothers I came into contact with seemed to be doing a marvellous job of being a mother, making sure their children’s emotional, educational, psychological and social needs were all being met while I worried about whether I was too gentle or overly lenient, and that I wasn’t teaching E how to be socially conscious or spiritually aware. I catastrophised over what school to send E to, I catastrophised a little bit more about whether my delivering him a Scotch Finger biscuit with a Kit Kat on a side tray may come back to haunt me in E’s teen years. I didn’t feel I was giving E the best start in life, so I made up for it by giving him everything. Easy! "I worried I was a bad mother." Image: Supplied. But if I were to tell the real truth, dear reader, I felt pushed aside at work, disrespected and marginalised, with a sinking dread that I had run out of options. I was planning my upcoming European Inspiration trip and working on next season’s dresses, but with the constant changes I often didn’t know who the strangers were in my weekly team meetings. I was spending more and more time alone in my work space, staring into the void through falling autumn leaves and absent-mindedly searching for dress patterns. The Brand meetings were now informal cold wars. New employees from chain stores such as Cotton On, Blue Illusion, Target, David Jones and Myer, new smiling assassins, were brought in to mull over and dissect what the problem with my Brand was. Everything had changed. Stores opened without my knowing, as did an online AH store, an eBay store and several factory outlets. An Alannah Hill make-up line was apparently on its way from China, a workwear diffusion line on its way from China, swimwear on its way by boat to an Alannah Hill store I wasn’t aware was opening. 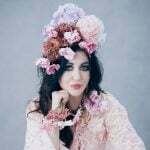 Alannah Hill floristry, Alannah Hill clones – all on their way from China! A lawyer informed me months later that my name was also being trademarked for alcohol including cocktails and Alannah Teenies (martinis!). I was always angry, lately. Furious. I was blowing up at David (if I could find him), running toward his silence, demanding to know how many dresses I had to design for the Spring Carnival and why, why, was I suddenly taking instructions from my sample machinist? I was dragging my friend and great supporter Andrew Majzner from Paper Stone Scissors into meetings with David. Andrew did everything he could to explain to David that I hadn’t ruined the brand with my David Jones faux pas. But David wouldn’t listen. I was a blocker and he’d made up his mind that I was slipping. And blocking. My assistant Sebastian explained on the telephone one day that I should get a doctor’s certificate to prove the amount of stress I was enduring. ‘If you have a doctor’s certificate, Alannah, you cannot get picked on,’ he said. I had never obtained a doctor’s certificate, but I respected Sebastian and listened to his advice. I sat opposite Dr Rooney in his cramped fluorescent-lit office. I wasn’t listening to my GP’s concerned tones about how stress, childhood trauma along with a feeling of not having any control, can be catastrophic. I was waiting for him and his worries to finish, and to hurry up writing my certificate and a script for Valium. Want to hear to more? Subscribe to No Filter here. Dr Rooney had seen me through my darkest and finest hours, offering medical help for stress, depression, anxiety and, once, for a broken finger. He wanted me to stop, to stop everything I was doing, but I refused. I couldn’t stop. I wouldn’t stop. The idea of ‘stopping’, the very thought of stopping, was a completely alien concept, and I was aghast with anybody who dared tell me how I should just stop. The next morning, I gave my doctor’s certificate to a Factory X receptionist and, with blatant disregard for the medical news inside, I worked throughout that day. When I arrived home the same evening there was a work email in my inbox explaining when I could go back to work. I could go back to work, according to the email, when Dr Rooney thought I was well enough. My doctor’s certificate simply said I needed a week’s rest. But I never went back to work, and I was not prepared for the ending when it finally came. There were no goodbyes, no death-defying wails from the lipsticked pouts of the Alannah Hill girls paralysed with grief over my departure. No matter how many moments pass, no matter how many years come and go, I’m yanked back to this one event, this colossal and gigantic moment where I said goodbye without really saying goodbye. On 15 August 2013, I became unemployed. Factory X would continue to operate the eighteen Alannah Hill &apos;bow teeks&apos; nationwide. They would continue to operate the Alannah Hill David Jones concession stores. I would not design for, or have any further input into, the brand that bore my name. I left Factory X without a button, a zipper, a piece of floral fabric, or a friend. Everything I had worked for belonged to Factory X. All I had left were memories, and I think we all know, dear reader, that often, memories are not enough. This is an edited extract from Butterfly On A Pin by Alannah Hill published by Hardie Grant Books RRP $32.99 available in stores nationwide.